I don’t really use a screener, see my latest post on how I find my ideas. Any insight onto what drives revenue? I mean, you can see the operational prowess that management has as they’ve increased both gross and operating margins over the time frame you have posted. The problem obviously is sales are not increasing. This could be interesting if you have any insight as to whether sales might rebound, in conjunction with stable (or even improving) margins. I think macro factors are playing a big role in demand for the companies products. When a new house is constructed there is someone who wants a new garden, a new fence and possibly new tools to do maintenance etc. At the same time I’m guessing that a lot of their products are a bit commodity like, and that consumers have plenty of choices. But don’t have any real insight, otherwise I might have had a position. The reason their sales went down with the crisis is that their biggest business, wood distribution, was destroyed. They don’t make money off it anymore. Their margins changed because now they’re in a different business. 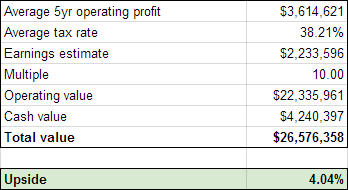 Since their profits come almost completely form a new business that grew from nothing, I don’t think it makes much sense to take the average earnings of the past five years. I think that taking, say, the last two years makes more sense, or $3m after-tax. That’s worth $30m. Add cash of $4m and you get $34. So, if you buy today, you get a 24% discount. That’s what the company is worth in a bad scenario, where the lawn/garden/pet business stops growing, the wood distribution business never comes back, and the real estate where the seed business sits is never sold (the seed business breaks even and was acquired just because management thought the real estate was cheap). But management thinks the lawn/pet/garden business will keep growing nicely, both through new products and new markets. And they think they’ll eventually be able to sell the 12 acres (in an intersection) where the seed company sits for a good price. They have proved to be competent managers and capital allocators, and have the right incentives (almost like nowhere else), so it’s reasonable to take them seriously. So, I think there’s a good chance good things will happen, and even if they don’t, investors are very likely to still do OK as your post suggest. 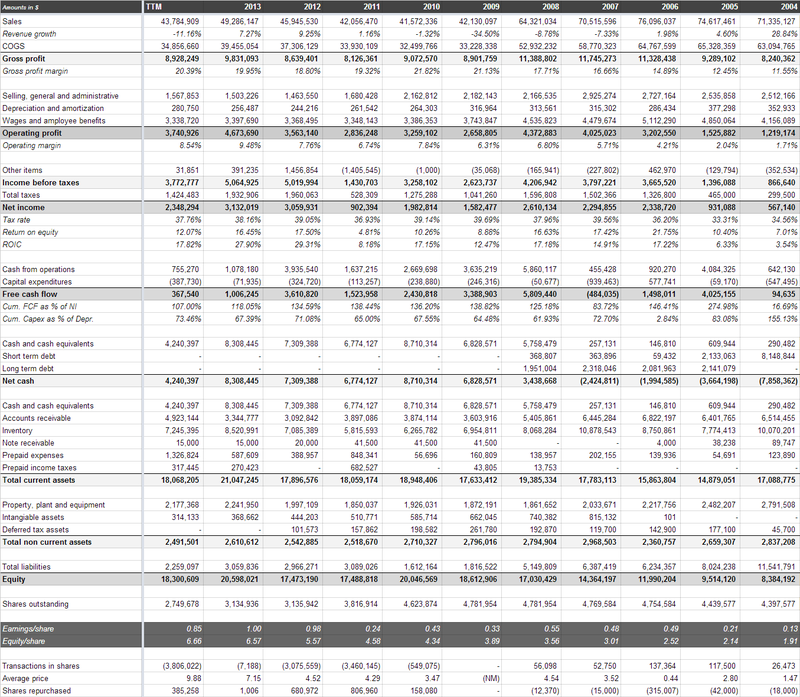 I only checked what happened with the various segments in the past two years and all segments showed declining revenue. So just a temporary hick-up for the lawn/pet/garden segment in your opinion? That could change the story of course. Even if you only look at the past two years, it’s not a horrible picture: lawn/pet/garden revenue is a little bit down in the first nine months of fiscal 2014 (25.5m vs 26.7m in the first nine months of last year). The year before it grew from 29.8m in fiscal 2012 to 34.6m in fiscal 2013. I don’t know if the slight revenue decline of the past nine months is temporary, although management thinks so. If it is, investors will do very well. If it isn’t, they’ll likely still do OK.